The moment one ceases to be self-centered and transcends one’s ego, one becomes capable of enlarging his repertoire of consciousness so as to enter a vast gestalt where universal thoughts and idea–forces, cosmic energies, archetypal images, universal rhythms of art and music, universal ideals, perennial wisdom, universal dynamisms, universal love, universal brotherhood and all that falls in the domain of ego–transcendence intermingle to weave the matrix of Cosmic Consciousness. In this cosmic scheme, the individual is a distinct point co–existing with countless such ‘points’, and knowingly or unknowingly, influenced by vast cosmic forces. If one is shut off in one’s own ego–centricity, then one thinks oneself to be the center of the universe. 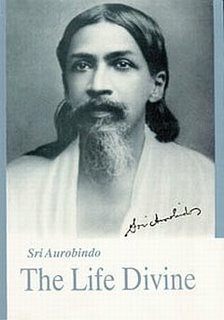 If one is successful in breaking the veils of ego–centricity, one is immediately aware that an individual exists only in relation with others and that one is not the ‘center’ of the universe but a center within the universe and through whom universal, archetypal ideas and forces act to produce effects that have universal ramifications. In this process of universalizing oneself, the individual ‘center’ does not become insignificant but becomes a ‘conscious ‘center’ in the cosmic whole, a better instrument to implement the cosmic agenda. When the idealist proclaims – ‘Unity in Diversity’, or ‘All Religions are One’ or lectures on ‘Universal Brotherhood’ or when musicians sing ‘We are the world’, it does not necessarily mean that a poise in the cosmic consciousness has been achieved. No doubt, such concepts overwhelm the human mind because of the ‘presence’ and ‘pressure’ of the cosmic consciousness as a living reality. However the votaries of such ‘universal concepts’ have not necessarily started ‘living them’ unless they have undertaken the ardent pursuit of breaking the limits of the ego – a pursuit where the goal is ‘spiritual’ in essence but whose path is a psychological growth in consciousness. The Approach of Psychology: Depth Psychology approached the field of cosmic consciousness with Jung’s unraveling of an aspect of it as ‘collective unconscious’ that holds the archetypes or ‘universal patterns’. These universal patterns shape psychological life and explain myths, symbols and motifs that recur in stories, legends, poems, dreams and fantasies. Of late, Transpersonal Psychology has expanded the scope of ‘cosmic consciousness’ beyond the Jungian paradigm by postulating the concept of the ‘Intermediate plane’ – the realm that holds not only the Jungian archetypes but also the subtle energies, subtle processes and beings, like the auras, subtle energy-fields, the Shamanic forces etc. The Approach of Parapsychology: Parapsychology deals with phenomena that are usually perceived to be ‘extrasensory’ in nature. It studies phenomena (known as ‘psi’) like Telepathy, Clairvoyance, etc. However, the existence of such phenomena cannot be explained unless one conceptualizes them to arise from the matrix of the cosmic consciousness. How is information actually conveyed in a phenomenon like telepathy? Scientists tried to study this by examining the ‘energy–expenditure’ of information processing in psi and found that even blocking of electromagnetic emission could not block extrasensory perceptions. In some form or other, some aspects of the working of the cosmic consciousness have to be explored to understand psi. Parapsychologists are already contemplating a sort of universal mind holding a memory bank (Akasic Records), which becomes accessible either in states of heightened sensitivity or in yogic trance-states. Such a collective mind (Lyall Watson called it ‘Sama’ in his book ‘Beyond Supernature’, 1986) may be a medium through which individuals make contact with one another, albeit, unconsciously. Yogis might develop the technique of acting through this universal mind ‘consciously’. The Approach of Science: Strangely, science itself is slowly acknowledging the existence of cosmic consciousness in its own way. Animal experiments have shown that there are non-biological and non-physical fields by which transmission of ‘learning’ and ‘adaptation’ can take place. Wasserman (mentioned by Sheldrake in ‘A New Science of Life’, 1981) had proposed the concept of Morphogenetic fields through which such transmission can occur. Sheldrake (‘A New Science of life, the Hypothesis of Formative Causation’, 1985), in his experiments with rats found that even rat behavior necessitated the acknowledgement of such types of fields through which ‘morphic resonance’ takes place. In fact if rats learn a trick at one place, other rats at other places pick up the trick even faster. Sheldrake opines that inanimate matter also is subject to morphic resonance. The Approach of the practical yogi: The practical yogi who wants to be in tune with the cosmic energies also uses different techniques to tap different dimensions of the cosmic consciousness. In doing so, he comes into experiential contact with universal energies that have great rejuvenating and healing powers. Once tapped, these energies can be used not only to work upon one’s own self but also to work upon others. He can also be in contact with the universal mind and thus have access to perennial wisdom (that is why a yogi can have a wisdom that exceeds all academic training). He can be in contact with universal positive forces as well as universal negative forces. The cosmic consciousness is a pot-pourie of forces--huge, negative forces and energies co-exist with positive forces; falsehood retains its territory as much as truth. If there are gods (positive forces) in the cosmic consciousness, there are also the demons, the Satanic energies, the titans (negative forces). That is why the Mother warned that the experiential contact with cosmic consciousness, so beloved of yogis, does not automatically signify a great spiritual breakthrough. ‘The Universal movement is after all a mixture of falsehood and truth, so that to stop there is to be imperfect…’ (The Mother, Collected Works, Vol. 3, Pg. 168). In fact, one has to pass beyond to something that still exceeds the cosmic consciousness: ‘The Transcendence’.